I've had these photo held up here in a Draft since April 6 2014. Having jumped back on the quilling train this past week after a few fallow years, I figured this was the perfect time to resurrect this post. 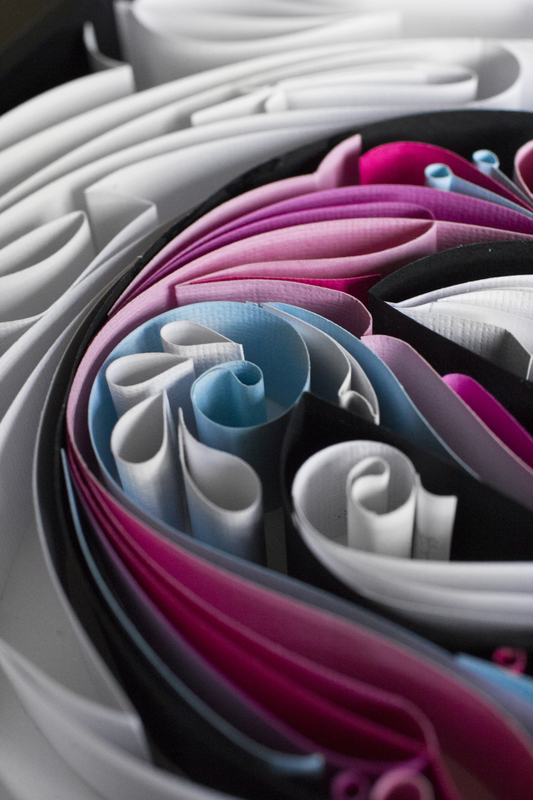 I was drawn to quilling after stumbling across the work of Yulia Brodskaya on PInterest. We did a few single initials for birthday gifts and this full name for Chloe's first birthday back in 2011. We kept this for a long time, I think we must have finally parted with it last year, all the letters except the O which I'm pretty sure was Kevin's contribution. Being the more meticulous one who also happens to enjoy pin-striping as one of his many hobbies, he has taken over the quilling projects. I choose the font and the paper colours and leave him to do the majority of the work. When areas of contention come in to play, I contribute potential solutions. We are a good team. Here are a few documented photos of the CHLOE prior to its disassembly and discard. Her daughter's name is Eve. My girlfriend Caela also freaked out because she wanted the C. We definitely could have done a better job, and have done better ones since, but it was the first one we made so, you know… It's pretty obvious how different and thoughtful Kevin's "O" is from the rest of the letters I did with nothing but curlicues. Anyway, Eve just had her 5th birthday this weekend and I've decided that Kevin needs to get back on the quilling train. What better way to get the quilling juices flowing than to do one for one of our very best friends! So, first things first: Shooting these guys dead on is not the way to show them off, but it's gotta be done. They are meant to be admired from multiple angles to really get the full effect. I love how his decision to create a scene with the white background: the sun, the leaf, the waves down below and the beautiful bird. The bird was initially without beak detail or the legs, those were my contribution - ATHANKYOU - and I just can't get over how perfectly the bird blends into the background but totally stands out once you notice it. I think one of the next pieces definitely needs to be some sort of jungle foliage with a few colourful birds in a similar style. So pretty. More to come in the next few months!